As a person living in the modern era, the power of computers can’t be forgotten. For every working professional having a good personal computer is a huge necessity. As a student, you can harness the power of the internet and do better projects if you have a good laptop or computer. Even as a person staying at home, the entertainment that laptops can provide with music, movies, and games can make your life so much easier. In this article, we will discuss few latest and most powerful laptops which are available in the Indian market at the price point of 40,000 or below. With these devices on your hand, you can play even the most graphics demanding games and can enjoy them in high-definition resolution without any lags. Furthermore, you can also use them to run resource hungry (regarding RAM and processing power) applications like Adobe Photoshop, Illustrator, Mathematica, etc. But if you are a basic user then you can get a fantastic day to day usage of a word processor or spreadsheet management software from every machine on this list. There are few important points which every buyer should know when looking to buy a new laptop. The first thing that we suggest you do is to write down a list of priorities you want on your device. This could be CPU, RAM, Hard Disk (HDD or SSD) or even a graphics card if you are someone who loves to play games. Once you have decided your priorities, you will need to fix your budget and then the brand that would be the most suitable according to your requirements. If you want to have a better configuration like SSD storage, Intel Core i7, 4GB or even better graphics card, then will you will have to increase your budget undoubtedly. By extending your budget by 15,000 to 20,000 rupees, you can get your hands on some premium gaming laptops. But remember, most of the time as the components increase, the weight of the device also increase. This might be an issue for few peoples. Before I start discussing the specifications of A555LF, let me tell you one important bonus you get with it. It’s the only model which comes with two years extended international warranty worth 2999 rupees free of cost. Furthermore what’s even more interesting is the fact that the power adaptor is covered under this warranty which makes the deal even more impressive. 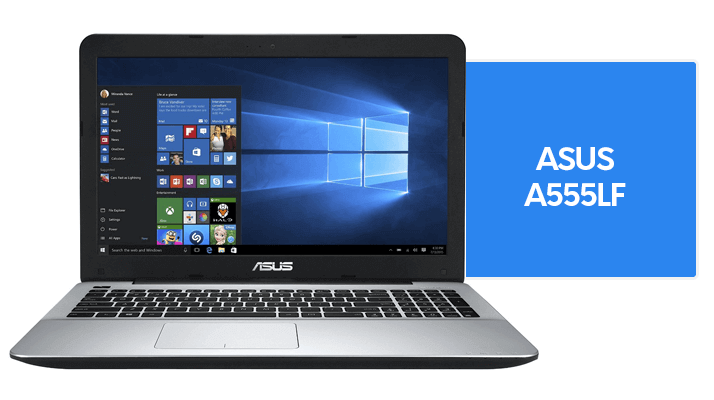 The A555LF-ZZ406T from Asus is an excellent choice for people looking for quality, high-performance laptops under 40000 price segment. This laptop is adorned with the looks and feel of any premium products that would cost almost double in the market. This device surely stands out with the viewing experience that comes with the 15.6-inch display with a resolution of 1366 x 786 pixels. The performance is powered by a 2.0 GHz Intel Core i3 5005U Processor is quite capable of running sophisticated applications without any hassles or lag. It comes pre-loaded with Windows 10 Home Operating System. You don’t need to pay any premium for the OS, and it fulfills the needs of any person be it a student or a working professional. The laptop weighs around 2.3 kg which makes it tick a little on the heavier side, but given the size of the screen, the weight seems justified. The battery is known to last up to hours consistently which is a victory if you consider the price range of the laptop. The 4 GB DDR3 RAM is quite low when compared to its competitors in this price range. But then to fulfill the gap, it comes with 2GB Dedicated NVIDIA GeForce 930M graphics card. GeForce 930M can easily handle most of the latest game titles and can even play GTA V in low-medium settings. Hence, the laptop is an excellent choice for any gamer looking for a laptop with a solid performance. Nvidia Graphics Card with 2GB dedicated RAM. Windows 10 Operating system preinstalled. Fans are very silent even while playing games. HD screen with sturdy build quality. Two years extended global warranty free of cost. Comes with SonicMaster to offer superior sound quality. 4GB Ram but you can extend it to 8GB by spending 2000 rupees. HP makes this list once again, and this goes on to prove how good their laptops are. Model AY513TX is truly the best choice for those who are frequent travelers and who want to experience the power of a high-performance laptop. AY513TX Apart from being extremely mobile, it features some outstanding specifications. Let’s start with the display. It comes with a 15.6 inches HD display which offers maximum 1366 x 768 resolution. The screen is bright and sharp, and the picture quality is excellent. It comes with 6th generation core i3 6006U processor which offers speed up to 2.1GHz. The 8GB DDR4 2133MHz RAM helps to boost the performance and speed even further. One drawback is that it has a 5400rpm 1TB hard disk which offers the maximum read and writes speed of 80 MBps and 100MBps. For the typical users it won’t be an issue, but if you are more into gaming and using applications like Photoshop and Illustrator, then you might face some loading issues. Coming to the GPU, it comes with a powerful and notebook optimized AMD Radeon R5 M430. It’s a 64-bit architecture-based graphics card and offers 2000MHz speed and comes with 2GB dedicated DDR3 RAM. It provides comparable framerate and performance to Nvidia 930M. HP 15-AY513TX comes in a very stylish color which is metallic gray. It also has 3 USB ports, 2 of which is USB 2.0 and the 3rd one is USB 3.0. As you might have already guessed that this laptop is made mainly for work purposes but you can still enjoy latest game titles like Titanfall, GTA V but then you might have to keep the game settings to mid-low. Now for those who are concerned about the weight, well let me tell you it’s close to 3KG. Yes, I know, it’s quite heavy, but it’s because of the high standard materials which are used to build it. The display is rigid, and the touchpad area gives you a feeling of aluminum and is very responsive. As for the operating system, it doesn’t comes loaded with any pre-installed OS. It has a great design and gives you feel of metal finish. 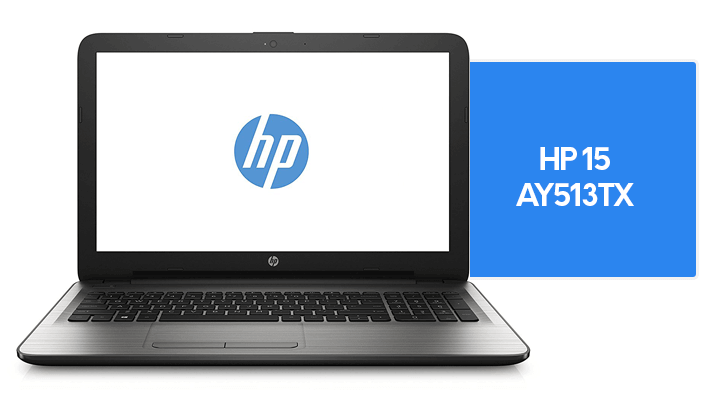 HP 15-AY513TX comes with 8GB DDR4 Ram. It has a 2GB dedicated graphics card from AMD. Battery life is good with a standby time of more than 14 hours. Gives you the power of 6th intel processor. It weighs close to 3 KG which might be a problem for few users. 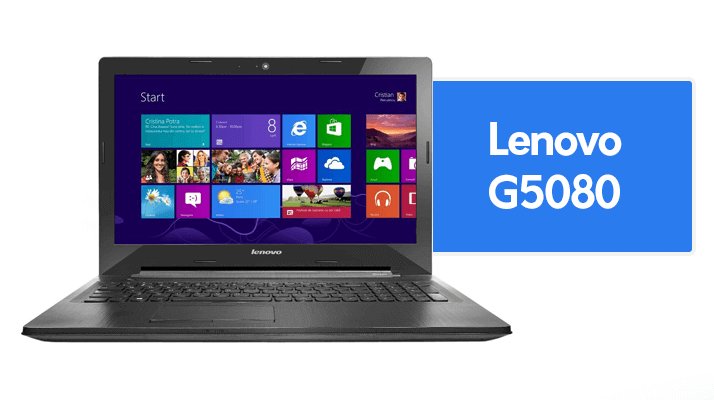 The G5080 Laptop Model is a solid offering from Lenovo in the mid-range price segment. It has an excellent backlit display with a sharp resolution showing off some great vibrant colors. The processor is 2.0 GHz Intel Core i3 5005U (5th Gen) which is quite reliable and has been known to offer excellent battery life. The 8 GB RAM seems ample to ensure that the laptop always stays high on performance. The gadget is even ideal for multitasking and running heavy duty apps that can render many other devices into a hung up state. The GPU is a Dedicated AMD Radeon R5 M330 which will make sure that you can play latest game titles without any issues. The input devices also have an excellent feel to them with sturdy keys and a smooth touchpad. The working with the input devices is also nice and smooth. One thing that seems to have a problem with this device is the quality of the build. People with experience are known to have seen some wear and tear on the hardware with continuous usage. The battery time for the laptop is 4 hours, and this is quite good for light usage, but it is not great if you want to work long hours in remote locations. With time, the battery output time also reduces. The RAM is also non-expandable. The laptop is a good and reliable choice if you want to go forward with a device that seems good on paper and in real-life as well. Comes with 8GB DDR3 RAM. It has AMD Radeon R5 M330 graphics card. The design is a bit outdated. Even the name of the brand Dell speaks volumes about the quality of the device. Dell Laptops are known for their robust and unbreakable bodies which can handle the rough handling of everyday travel and quality bound performance that does not diminish with time. The looks of the machine are crafty, and you will definitely be a fan of them. The picture quality is extraordinary with HD LED-backlit display on 15.6 Inch screen size having a Display Resolution of 1366 x 786 pixels. The speedy processor and sufficient RAM manage to offer a good performance without lag. The 2 GB GPU gets the job done even with heavy multitasking and high-end graphic studded gaming. The laptop comes packaged with a Windows 10 OS having a useful DVD writer. Dell has always been famous for having one of best in class battery power that lasts up to 6 hours which is the highest in this price segment. 1 TB of storage gives the reader enough space to store movies, music, and documents adequately. The only problem users have faced with the laptop are slight heating issues when playing graphics-intensive games. This compactly designed laptop from HP is exceptionally lightweight and suitable for travel. The device has a WLED backlit display having HD resolution and a superior pixel density. The images on the screen appear to have natural colors and sharply defined details. The performance of the laptop is entirely satisfactory due to a 2.5 GHz Intel Core i5 7200U Processor and the 4 GB DDR4 RAM which is expandable up to 16 GB. This expandable RAM feature really enhances the value of the product because it allows the user to cope with future needs as well. The device can handle multitasking and heavy applications with ease. Speakers exhibit high sound quality with loudness and clarity. The battery backup enables even heavy users to forget about plugging in for as long as 8 hours. One of the issues of the laptop is the lack of a full HD resolution, and it sits a little bit higher on the price point with 43,990 being the Market Price. HP laptops have a history of heating up after 1-2 hours of usage, and this can affect the life of the entire device including the battery. Acer does not compromise on the durability, and the build quality of this laptop speaks the same thing. The size of 15.6 inches is suitable if you want to enjoy a good viewing experience backed up by 1366 x 786 pixels display resolution. The 2.5 GHz Intel Core i5 7200U Processor is good enough to meet all your day to day computing needs. The Graphic Card is not the best as compared to what is found on the other devices. The Integrated Intel HD Graphics will not be able to do justice to heavy-duty games and graphically oriented applications such as Photoshop, but it is still good enough to watch movies and enjoy a default graphic management experience. The device does not come with everyone’s trusted Windows Operating System. Instead, it contains Linux which is an efficient operating system for programmers but is not the friendliest for people not having a technical background. That being said, it is easy to replace the system’s OS, but you will have to buy a Windows Subscription separately. The battery is a plus when it comes to this machine. It provides effortless working with up to 5 hours of battery life and charges to 100 percent quite swiftly. The price point is lower than other laptops that contain Windows 10 Operating system. It’s probably one among the most powerful core i5 laptops under 40000. The Lenovo Ideapad series has been famous for being able to cater to working professionals with a substantial processing power and robust build. The components of the laptop appear to be highly durable as they are made of high-quality plastic. The processor is quite snappy as it is the latest 2.3 GHz Intel Core i5 6200U which is complemented by 8 GB DDR4 RAM appropriately. The device is quite graphic intensive as well due to the presence of 2 GB Dedicated NVIDIA GeForce N16V-GMR1 Graphic Card. The laptop weighs 2.2 kg having a screen size of 15.6 inches which makes it suitable for basic usage. The laptop comes with an MS-DOS operating system which is not appropriate for anyone in the modern times. DOS is a command-line operating system, and it is not user-friendly. The keyboard is entirely reactive and smooth, and the touchpad also responds well to multi-touch gestures as well. The battery life is able to last a moderate user 4-5 hours of repeated usage. Even though the built of the device is sturdy, the looks are not impressive, and that is a downside for many users. This innovative laptop from Lenovo has enough features to justify the price tag. The laptop is quite sleek and lightweight in design which makes it very comfortable for carrying around. The display is full HD display of the laptop delivers sharp and clear images to the viewer. The processor here is 2.9 GHz AMD A9 Dual Core which is a deviation from the trustworthy Intel processors which the world relies upon. Even though the multitasking and high-end gaming experiences are not affected by the specifications but the performance of the device, in the long run, is definitely inferior to that powered by Intel’s processors. The flexibility and the looks of the laptop are one of the USPs that separate it from the crowd. It comes with a Windows 10 Operating System that also contains a substantial battery backup. The absence of a fingerprint sensor could also be a disappointment to many users because some laptops in this price range also come equipped with that feature. All in all, the laptop is an excellent option for people who travel frequently, but the Processor is its downfall. We hope this list was able to give you a good number of candidates to enable you to find the best laptop in under 40000 in India. The price range is decent enough to let you buy a device that fulfills all your needs. We run multiple usability tests on the laptop to find out about all the pros and cons. Stay tuned to our website for more updates on good quality laptops. Do let us know about your selection and your experience with the laptop in the comments box below. It has everything that is needed for a basic but high-performing laptop nowadays. There is nothing that could have been done to it. It comes with Windows 10 operating system. As for the display size, it’s 15.6inches with Full HD resolution. This is one of those laptops that you will not find very lucrative at first but is probably one of the most relied upon for the understanding that you can do whatever you want to (except for tossing it around) with it. The processor is from AMD and has a 4GB DDR3 RAM. The resolution of the screen is very decent, and the best part about it is that it has a 1TB hard disk space. It even has a dedicated 2GB graphics card. This makes HP 15 AF103AX a very conventional performing device that will serve all your purposes. The only drawback is that this is not the latest model you would want to buy. This is a pretty old model as it still uses USB 2.0 ports. The RAM used are of 1333MHz. So, if you want a good and decent performing notebook, then this is the one you ought to buy. Another thing about this laptop is the battery life; it is not what is expected from a notebook which has pretty low specs compared to the latest ones. Dell is a company that resonates quality. One of the pioneers in laptops, Dell Inspiron, is one of the most trusted laptop models in the market. Though the specifications do lack behind some of the other competitors in this list the sheer brand name of Dell puts it on this list. It has a quad-core A10-8700P processor which can be turbo boosted up to 3.1GHz. Though the processor is a bit backdated, the other features loaded in this notebook are still top notch. It comes equipped with 1333MHz 8GB DDR3 RAM. It has an HD touchscreen display with maximum resolution of 1366 x 768 px. It is one of the key features of this laptop. It has a 1TB hard disk space for you to store all your data in the device. This laptop also has a card reader along with it, giving you all the necessary tool to carry your work forward. It also comes with preinstalled Windows 10 Home edition. The specifications are just right for you to do all your work on this device will efficiency and power. The thing about this laptop is the battery life. It is not what you might expect out of Dell, but it will not disappoint you as well. The laptop was made to help you work with greater efficiency. Which Laptop to Buy Under 40000? 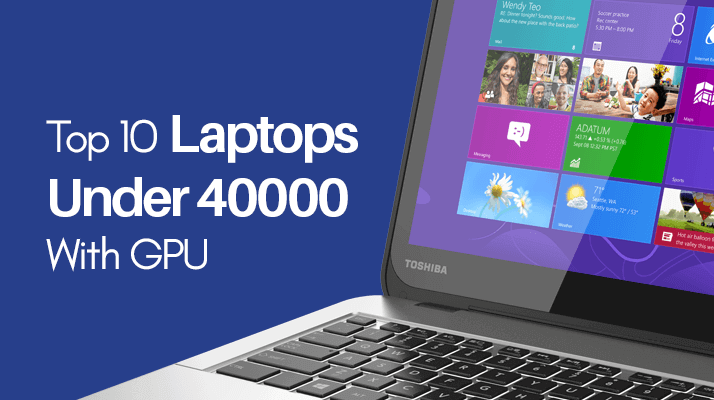 These are the laptops that will help you to grow and that will get your work done any day. One of the key features of these laptops is that you can carry them around anywhere for your maximum work efficiency. If you are willing to buy these laptops for gaming, then you will for sure have some decent gaming experience with them but you have to understand that gaming laptops are just an entirely different story. These are just for work, but you can use them for occasional entertainment if needed. Also, make sure that you keep your device from getting harmed. The warranty might be there, but if you have done any physical damage to your notebook, then the warranty expires. So make sure that when you are drinking coffee, you do not spill any of it on your notebook. Try to buy laptop coolers as well to make sure that your laptop is cool at all times especially when you are using any heavy applications or while playing games. These are the things that should be kept in mind while using laptops.